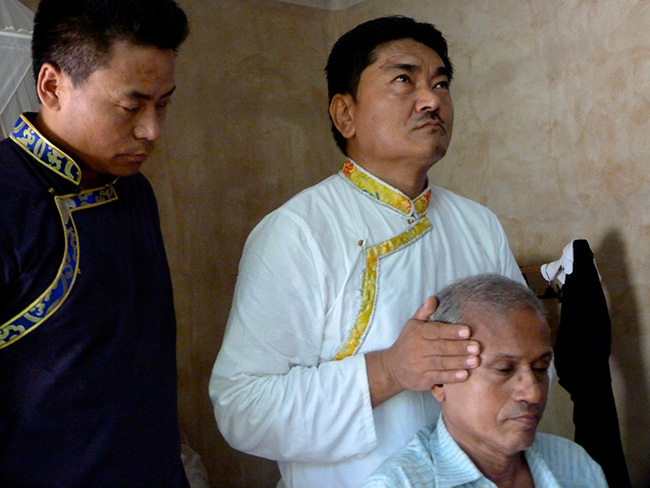 CA Kallianpur, National Co-ordinator, Friends of Tibet, who has dedicated his life for the cause of Tibet, suffered from a paralytic stroke that affected the right part of his body. But what mattered to him even at that moment was the issue dear to his heart! He pointed to the Tibet awareness materials kept for posting and instructed the person next to him to post it. His willpower and dedication for the cause, helped him revive within days and he was brought to the 47th Wellbeing Tibetan Medical Camp venue to consult Dr Dorjee Rapten Neshar, Chief Medical Officer, Men-Tsee-Khang, Bangalore Branch. 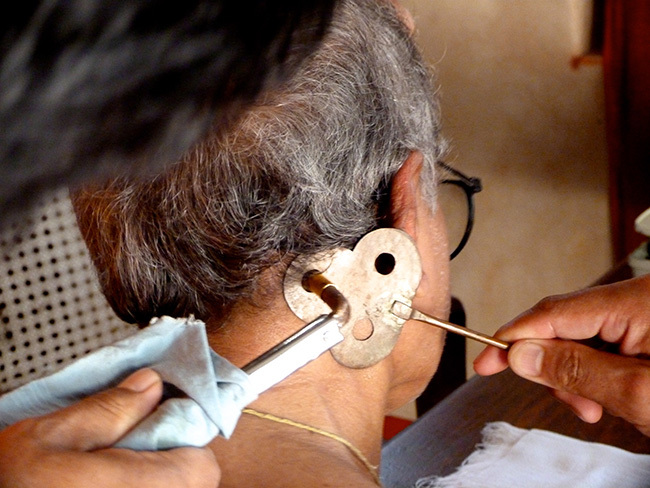 Later he was taken to Lakshmi Nature Cure and Yoga/ Ayurvedic Clinic, Thrissur, for an elaborate treatment. "What The Tibet Issue Is" talk series of CA Kallianpur was scheduled during the 47th Wellbeing Tibetan Medical Camp at Alleppey. The talk had to be cancelled due to the paralytic stroke suffered just days before it was to be held. Eswar Anandan, Campaigner, Friends of Tibet, had the good opportunity to stay with him as a bystander during his treatment and given below is an interview taken during then. Eswar Anandan: How did you get involved with the Tibet issue and when was it? CA Kallianpur: Basically I am a student of Military History and that's how I got involved in the Tibetan issue. I studied about the World War I and World War II, and all the wars that India has fought. When it came to the 1962 Indo-China war, there was a lot of confusion, with respect to the status of Tibet. Its suzerainty and sovereignty. So I went deep into the subject. And I found that it was a created issue. Tibet was a Manchu Protectorate. But unnecessarily China was taking sovereignty of Tibet. EA: Can you please explain further on this? CAK: Tibet was a Manchu Protectorate, like Nepal and Bhutan were British Protectorates and the Chinese were ruled by the Manchus. Today Nepal and Bhutan are Independent Countries. But why is Tibet not an Independent country? Am not getting an answer to that question. EA: So Tibet was not a Kingdom? CAK: It had many principalities ruled by chieftains later ruled by Dalai Lama Institution for almost 350 years. Je Tsongkhapa started Gelugpa sect which is the foundation of the Dalai Lama institution. Much later it was a Manchu protectorate. When the Manchus came to rule China, like the British were here and Nepal and Bhutan were British protectorates, and we cannot claim them. So on what basis (are) the Chinese claiming Tibet? EA: The Chinese were also a Manchu Protectorate? CAK: The Chinese were ruled by the Manchus. There was a revolution there which did not happen in India. British were not thrown out of India. If British were thrown out of India, then India that the British built would have been today's India? Would we be claiming Bhutan? Burma was a province of India for 51 years. But because the British were not thrown, there was no revolution here, unlike China. Manchus were overthrown there. And the China that they built came in the hands of today's China and they are claiming Tibet and Taiwan. CAK: There is no question of believing, the Manchus were actually the ruling power and the Chinese were under them, in China the Hans are the majority and they were ruled entirely by the Manchus. EA: Do you think that is the reason why Chinese started taking it for granted that Tibet is a part of China? CAK: Yes, just because Tibet was a Manchu Protectorate, and there was a revolution in 1911-12, when the Manchus were overthrown, and the China that they built came in the hands of today's China; they came in Tibet. It is like India claiming Burma. Once people understand this, everything falls into place. EA: Since when you are following the Tibet Cause? CAK: May be for about almost 30-35 years. EA: The curiosity of the 1962 war was what led you to the Tibet Cause? CAK: Yes, actually that brought me to look into the Tibetan Issue. To understand it, I had to understand the history of not only Tibet, but also history of China. It took me 10-15 years to fully understand the issue. EA: What is that you see as a parallel, there are many people who are trying to create parallels between Kashmir and Tibet Issue? CAK: See, Kashmir was a Princely State, Tibet was a Manchu Protectorate. There is no parallel, there is no similarity between the Kashmir Issue and the Tibet Issue. Protectorate is something different and Tibet was a Manchu protectorate, like Nepal and Bhutan were British Protectorates. Today Nepal and Bhutan are independent countries, whereas Kashmir was a princely state and choice was given to them to either join India or Pakistan in 1947, as per an Act passed in the British Parliament. It's very clear. There is no comparison. EA: How important is Tibet for India? CAK: See, one can see not just Tibet, Mongolia is important too in Asia. As far as India is concerned, Tibet was north of India's border, that's why it's important for us to take interest. We are actually neighbours and we don't know anything about our own neighbours, that in itself is a not a good sign. EA: Pre-colonisation of Tibet, India was having a peaceful neighbour? CAK: Yes, there was no common border between China and India. Have you ever heard of an Indo-China war in the last 2500 years or 3000 years — No! The first war was the1962 war, that is when Tibet was illegally occupied by Chinese and we got a common border (India and China). EA: Do you think the 1962 war, was not a war for Tibet, but an attempt by China to enter India? CAK: Well, we do not know what is their priorities or intentions, but as far as India is concerned, we should have taken a correct stand towards Tibet. It was not necessary to go on war, but at the same time it was not necessary for us to say that Tibet was a part of China! That's where we went wrong. It's very easy to do a wrong, but to right that wrong takes number of years. We had no common border with China, but a common border with Tibet, and for us for the last 2,500 or more years there was no war with China, because we never had a common border. EA: What should have India actually done, when there was a situation that China would be colonising Tibet? CAK: That time we could do very little, but there was no need for us to go out of the way and say that — Yes, Tibet is part of China! We couldn't do anything, but knowing the status of Tibet — that Tibet has a strong case in International law, there was no reason for us to say that Tibet was part of China! EA: And then giving refuge to Tibetans who fled Tibet? CAK: That was later on. Naturally Tibetans were a minority, they cannot fight a majority. Arms given to the communist, CPC, by the Soviets, you know, the situation was an unequal battle. And there was no way that the Tibetans could themselves throw, being numerically far inferior. Only with India's help, China could be confronted. EA: But why do you think that none of the countries came forward to help? CAK: That's because the British had kept the status of Tibet very nebulous. It was not clear to the countries concerned what the exact status of Tibet was — whether it was Independent or whether it was a part of China. EA: There was a confusion for the rest of world? CAK: Yes, there was a confusion for rest of the world. The British created this mischief. EA: Last 50 years, over 100 countries became independent! CAK: See, we should have seen that Tibet is India's neighbour, we knew better — what was the exact status of Tibet! Other countries in the world are not going to come and decide for us what the actual status of Tibet is. So it was in our interest. EA: How do you see, now that issue has now become mammoth? CAK: China is huge in population and also technology, so that's why unless and until we raise our technological level, it's very difficult to confront China. But population-wise we are not inferior to China. Please note that, they may be 1.3 billion people, we are also 1.2 billion people. So we are not less than China. But we are facing a lot of complicating issues — like part of Kashmir being illegally under Pakistan and a highway being built illegally through the area connecting Pakistan and China. So we have to take all this into account, when we plan our strategy. EA: How did you join Friends of Tibet? CAK: It was during the Festival of Tibet in the year 2000 in Bombay, Friends of Tibet had organised in a very big scale. I met Sethu Das, Founder, Friends of Tibet, there. And my interest in Tibet was predated. He felt that I should be joining Friends of Tibet as the National Coordinator. Earlier I had met him at St Xaviers College, Bombay in 1999 during the World Human Rights Day programme. At that time I had not shown much interest. EA: How do you think joining Friends of Tibet helps in voicing out about the cause? CAK: We are trying to educate people, especially those people who matter, who are the policy makers. By sending them Tibet Materials we try to tell in actual what the situation is, what is the status, what the solution is and what the difficulties in achieving that solution. There are two types of Materials that we usually send — Enlarged Set and the Comprehensive Set, the latter sent to people who are policy makers and also who matter. In the last many years, we might have sent around 3000–4000 materials all over. This includes the World With Tibet map and of course explaining what the Tibet issue is, copy of the Tsepon Shakapba passport Friends of Tibet recovered from Nepal in 2003 etc. When one goes through the materials, it's evident to the person that Tibet has a strong case under the International Law. We have not made a distinction. We have sent to all sorts of people, irrespective of the ideologies they follow. We have not made a distinction amongst the people to whom we send. What concerns most is they should know what the Tibet Issue is! EA: How important is the World With Tibet map? CAK: People have no idea about Tibet, but when they look at the map they tell us that they never knew Tibet was such a big country! In fact, Tibet is as big as Western Europe, but people have no idea, because it was never shown. We are the first people — Friends of Tibet, to show World With Tibet map. Newspapers in China and Mongolia published reports on the political map of the world produced in India. Maps are extremely helpful to get a clear idea about a country. This helps when People don't have any idea. EA: Was there any response to the materials sent? CAK: It's the policy makers who are responsible to make the right policies, the common man — I don't blame them. Common man cannot come to know, and he has no power to make policies. But they have the right to know the right information. EA: What do you think is the way forward? CAK: The only way forward — China is an ancient cunning civilisation! Unless and until they are provoked they won't get into conflicts. They are very cunning in that manner. The only way I see that we can put them into a difficult situation is — Kashmir. A part of Kashmir is occupied by Pakistan. And if they give us a cause for threat, by say, waging a war with India, India should not, this time at least, under no circumstances avoid re-taking back the whole of Pakistan Occupied Kashmir (PoK). The Chinese might create problems for India, since they are involved in the Kashmir Issue. If such a situation arise we need to liberate Tibet the same way we liberated Bangladesh. If you look at recent history, Cambodia regime was creating problems for Vietnam in 1979. It was clear that the Vietnamese would overthrow the regime within 24 hours, and they did it. It was also clear China will attack Vietnam, which happened. India should be prepared. EA: Do you think if this situation continues, then there would be another attack on India? CAK: As far as Kashmir is concerned it's very clear that we have made a wrong decision. Pakistan is illegally occupying a part of Kashmir. Unless and until this place is retaken by India there is no solution to the Kashmir problem. But here the additional problem is China. I would like to conclude with that. 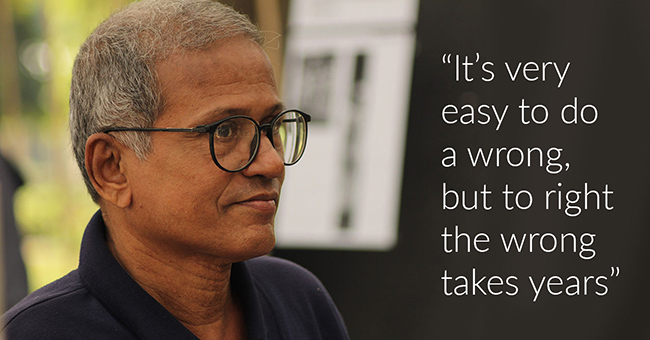 This interview was conducted by Eswar Anandan, poet and 'Friends of Tibet' Campaigner. He can be reached at eswar.anandan@friendsoftibet.org. Photographs: Sylvie Bantle & Satyan Badolai. CA Kallianpur, National Coordinator of Friends of Tibet is being treated by Dr Dorjee Rapten Neshar and Dr Lhundup Dorjee, doctors from the Men-Tsee-Khang during the 47th Wellbeing Tibetan Medical Camp organised jointly by Friends of Tibet Foundation for the Wellbeing and Men-Tsee-Khang, Tibetan Medical and Astrological Institute of HH the Dalai Lama.